Recently I wrote an article for a client on how creatives get their ‘ creative juices flowing.’ (It’s in the editing queue or I would totally link to it). In order to get some insights, I posed a question on HARO, and within a day my inbox was flooded. Writers, designers, illustrators, and craftspeople were all full of ideas on how to make ideas happen and get creative. As I began to leaf through their responses, something struck me: each of these individuals has their own creative process. All of them have a way in which they go about starting, sustaining and finishing a project. A few people even described their creative process to me, with others just highlighting a phase or step they take when creating. Then I realized something else: I was not familiar with my own creative process. As someone who’s been writing and drawing since learning how to hold a pencil, you’d think I’d have a hint by now. Nope. Thinking about how I create feels like closing my eyes and trying to picture my face. Strange. If you’re like me, your creative process may be a bit of a mystery to you; it may feel strange to try and capture it and duplicate it later. But I’m convinced that unlocking my (your) process is the key to understanding how to improve both the process and the final result. With each phase, I’ve listed a few questions you can ask yourself to better understand your personal process and start thinking about ways to improve it. Everything starts with an idea. Ideation may happen when you’re lying awake in bed, going for a long walk outside or taking a shower. It’s different for everyone, so the key to this step is finding out what starts your idea engine and making time for that activity. Ask yourself: where and when does ideation happen for me? * Do I carve out (enough) time to do the activities that bring me ideas? 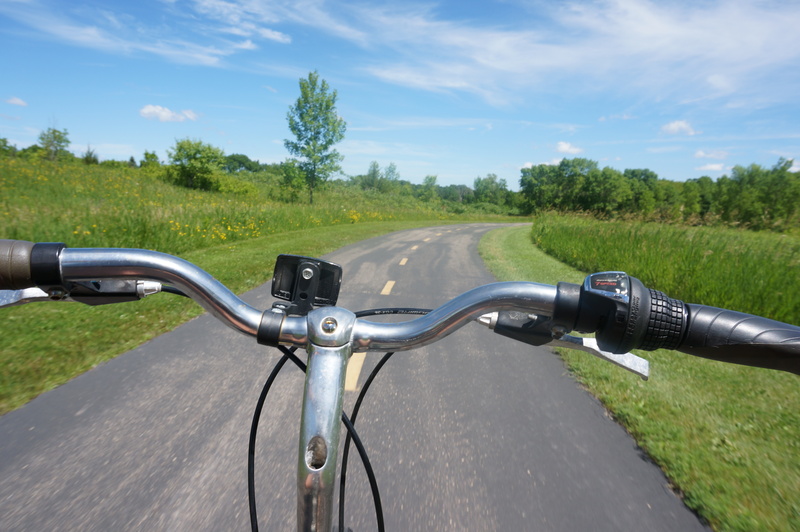 For me, spending time riding my bike or walking in nature is what inspires ideation. This is the phase when you actually start to put the pen to paper, fingers in the clay, a brush to canvas. Actually starting can be the most difficult (and longest) step in the process. As you think through your creative process, you may have several sub-steps* that fall under invention in order to get you all the way through to the next phase. Ask yourself: what holds me back from starting to invent/create? Where do I do my best inventing/creating? Do I have (enough) time carved out to invent/create? This is the phase in your process when you look back at your work to reflect and evaluate. For writers, this is asking someone to read your work, going to a beta-reader or hiring an editor. This is also self-reflection, thinking through and assessing your creative process and your finished project. This step is often ignored and can be the scariest part of the creative process. It’s hard to think about our work objectively and face the flaws, but ignoring the reflecting phase is as silly as denying the fact you have a hammer in your house. This phase is a powerful tool that allows us to hone our craft and improve our process. Ask yourself: do I actually reflect? If so, do I use reflecting to improve my finished product? Do I have (enough) time carved out for reflecting? The final* phase in the creative process is reinventing (re-crafting, or recreating). Often after reflecting, we can feel overwhelmed or sick of our project and give up on or ignore it for a time. Getting to the point where we are actually willing to reinvent can be difficult, but is absolutely key to accomplishing our creative process. Reinventing is the place where we take what we learned in reflection and improve upon what we’ve created. Though the name I chose for this phase might suggest a total over-haul, that is not the intent. The reinventing stage is to simply re-visit what you’ve made and make improvements. Ask yourself: Do I allow myself to reach this step? What is hard for me about this step and how can I remove these barriers? Do I have (enough) time carved out to recreate? *We may go through several rounds of reflection and reinventing before we finally “finish” with a final round of reflecting. For the comments: How do you create? I’d love to hear your thoughts and ideas about your own creative process and what makes it work!